Finding the ideal girls for your sorority takes both time and effort. You don’t want to choose merely any girl to join without even knowing something about her. For selecting the right girls that stand for what your sorority signifies and that will also respect your fellow sisters you need to be precise and careful. In order to be a good and successful sorority recruiter, you must first comprehend what your sorority needs. You must then make use of your communication skills to become acquainted with your potential recruits so you can choose the apt decision for your sorority. Sororities are female student’s organizations that grant community service, leadership opportunities and social activities. A sorority is a group of women formed by a sisterhood who share common goals and aspirations. The members take a pledge to each other for life. The women who form a sorority share their friendship, efforts and knowledge. Together these women gain knowledge, grow and make the sorority, commonly known as a Greek organization, powerful. The common experience of these women builds ties that remain throughout their life. Sororities have been a part of college since the end of 18th century. These organizations are known as “Greek” because their names are made of Greek letters that provide as a reminder of the group’s ideals. 5. Learn how to market yourself. Sorority recruitment depends mainly on having conversations. Round after round, active sisters must maintain the conversations and keep going strong. It’s the main way to decide on which potential new member (PNM) to select. Remember the needs and goals of your sorority for the whole time. Carry out a brief meeting with your fellow sisters and ask them ways that could help sorority improve. Discuss what kind of girl could aid in improving the sorority. For example, if your sorority wish to become more active in charity work, you should look for girls that take pleasure in volunteering and can bring their understanding to your sorority. Have a discussion about the kind of girl that would fit in well with you and your fellow sisters. Pay close attention to all girls you see at parties and other get together. You should always opt for girls that not only love socializing but work hard and study, as well. If you only notice a girl at parties and never see her at a library or a class, learn more about her before considering her. Look for girls that demonstrate enthusiasm and keenness for your sorority. While you are at your bid party, scope out the zestful girls that are socializing with other sisters and seem to show a real and genuine interest in the goals of your sorority. If you know some girls that you think might be a great fit for your sorority, learn more about them through their social networking profiles. However, you should not merely judge a girl through her social profile; just keep in mind the good and bad qualities you find out. Speak to all the girls and give them a fair chance to grasp your interest. Set off a conversation and push potential candidates to ask any questions regarding the sorority and to also talk about themselves. You must always treat everyone with value and be polite. When you behave politely and take interest in what someone says, it makes her at ease, comfortable and keener to talk about her likes and dislikes. You should always ask questions that require some thought before answer. Steer clear of any dead end questions or answers that end in yes and no. You should not let your irritation with the heat, your prickly shoes, or your frustrations with the loud candidate close to you slide into your conversations. Don’t lose your balance and keep all your problems concealed and sustain a positive attitude in all the conversations. Recruiters should deal successfully over awkward breaks in conversation with some transition phrases and fresh new questions. You should know how to direct your talk in a fresh direction, when one subject matter has run its course. Please don’t shower a candidate or PNM with rapid fire questions. You should maintain a good equilibrium of talk and questioning. Starting a conversation with a question and comment about the date, time, weather, or location is acceptable. Rounds might be running late, it’s raining heavily for the third day in a row, or there’s a loud construction work going on next to the sorority house. A brief remark about what’s happening followed by an inquiry, is completely normal. It’s perfectly alright to discuss about the fantastic concert you attended yesterday, the recent news about a celebrity, or the football game where you had good seats, or you can simply mention any activity and then follow up with a question. Make sure your questions are not framed in a way that will make the PNM feel uncomfortable. Use true and tried topics such as; general experiences (college, hostel, sororities), ask how the other person is doing, tell a funny story, asking general interest questions can definitely bridge the gaps in an otherwise lagging conversation. It’s pretty easy to make yourself interested in OTHERS, rather than make them interested in you. 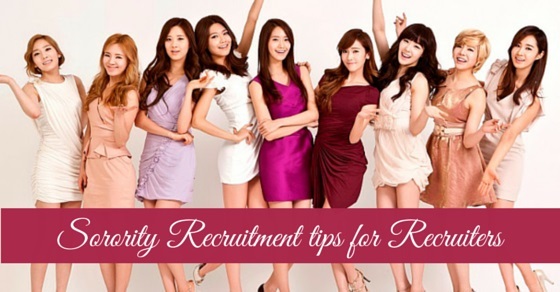 Using the above tips will help you in conducting sorority recruitment with ease. If both the sides are genuinely interested and determined on the other person, a stimulating and refreshing conversation is bound to occur. If you are too occupied with something else, or perhaps worrying about recruiting the best, you won’t be able to enjoy the talk and relax. 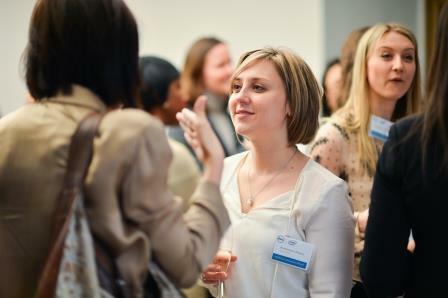 Avoid uncomfortable conversations by being attentive to the girl you are speaking with.